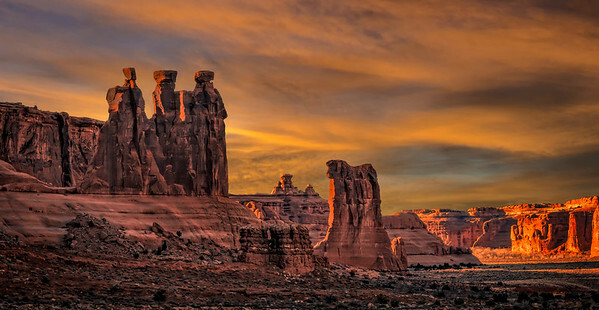 Images from South Eastern Utah. 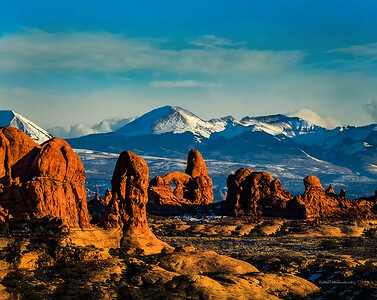 The Moab, Utah Area, including Arches National Park, Canyonlands National Park, The La Sal Mountains and Dead horse Point State Park. 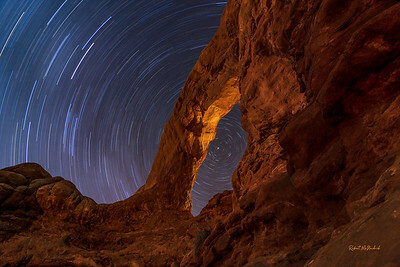 This is a 13 shot pano that I took back in June. 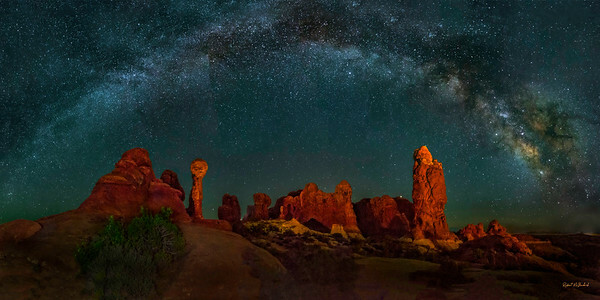 Garden of Eden in Arches National Park has some of the darkest night skies. There is a little light pollution on the lower left hand side of the sky. 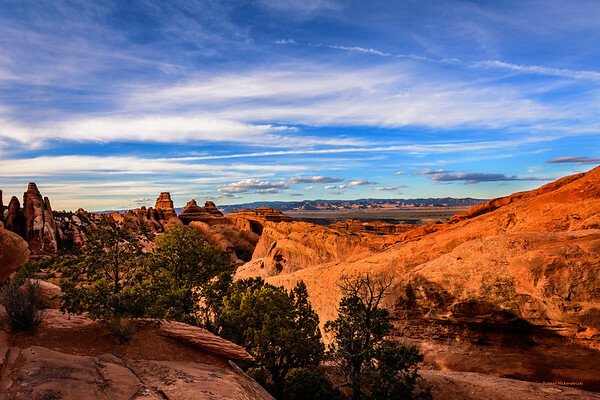 This is from Moab. 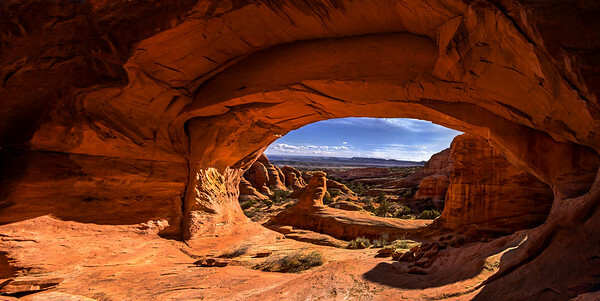 The North Window Arch is often referred to as the eye of Arches. Used to frame the stars and other features. In this version the eye is focused on Turret Arch. 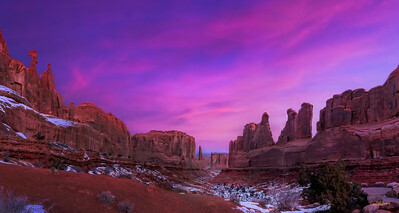 Arches National Park is spectacular no matter what time of year you go. 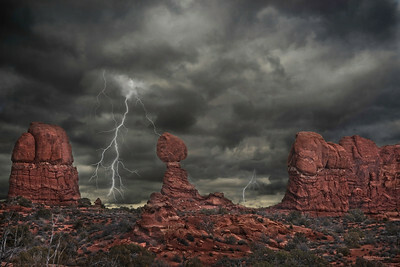 Winter seems to bring so much more contrast and drama to he image. Also there was hardly anyone else in the park. I seen maybe a dozen people and was able to get a number of images without people in it. A lot of snow this year has lead to some nice winter shots. 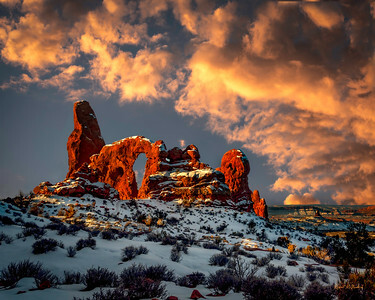 Love the contrasting beauty of the red rock in fresh snow. 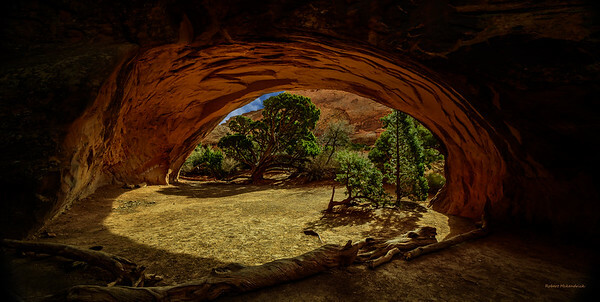 The beauty of Navajo Arch. 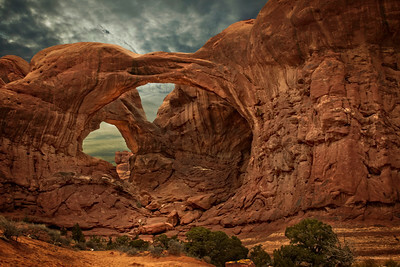 Walking the sandstone floor to pass under the arch. 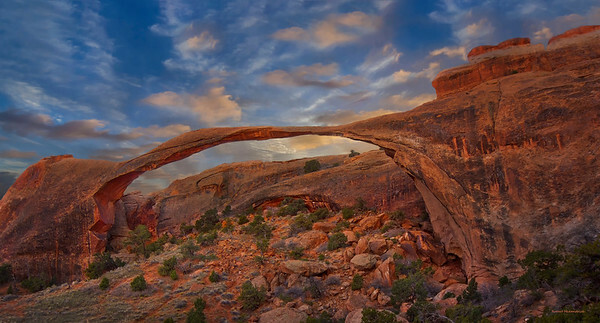 the glow of the arch is a result of the sunlight bouncing off the sand and illuminating the underside of the arch. 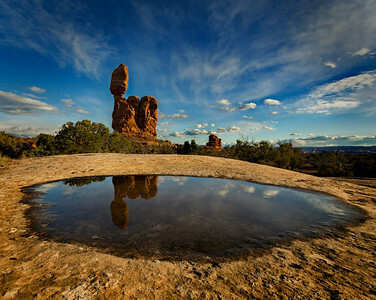 Balanced Rock sits perched upon it's pedestal. How knows how long it will be able to maintain it's position. To find a rain puddle in this arrid desert land you must time it just right. Be there shortly after a rain storm. 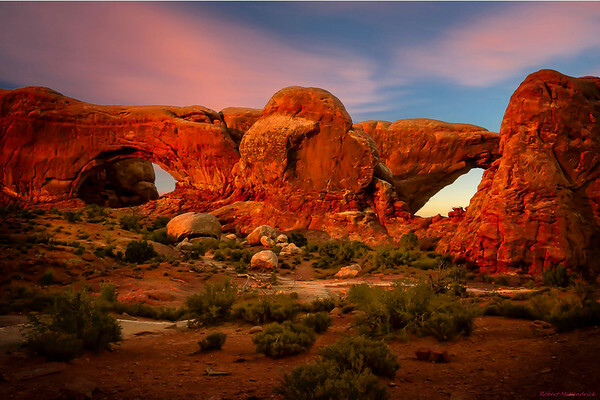 Double O Arch is the second largest arch within the Devils Garden area—after Landscape Arch of course. 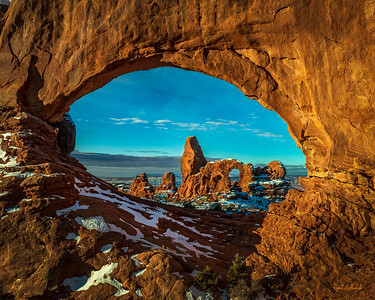 As the name implies, there are two arches here, one large, with a span of 71 feet, stacked atop a much smaller arch with a 21-foot span. Both are part of the same sandstone fin. 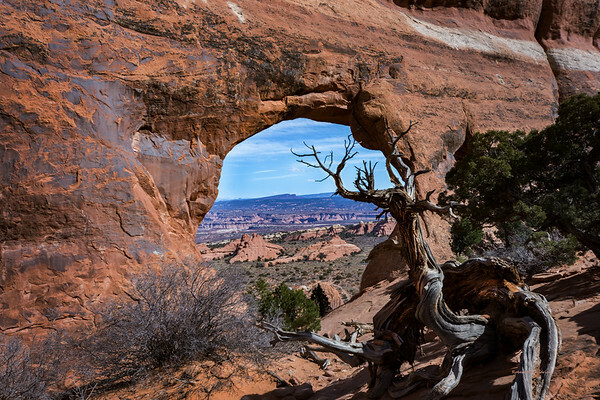 Double O Arch is located at the far end of the Devils Garden Primitive Loop, 1.93 miles past the Devils Garden trailhead and parking lot at the north end of the Arches Entrance Road. 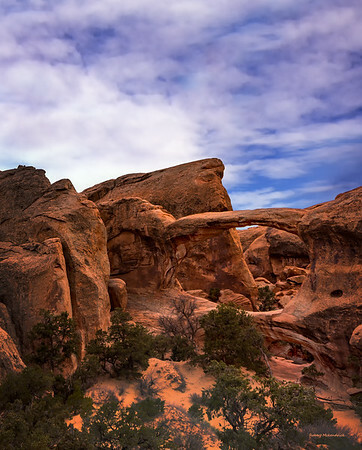 Past Landscape, the trail becomes much more rugged and challenging. 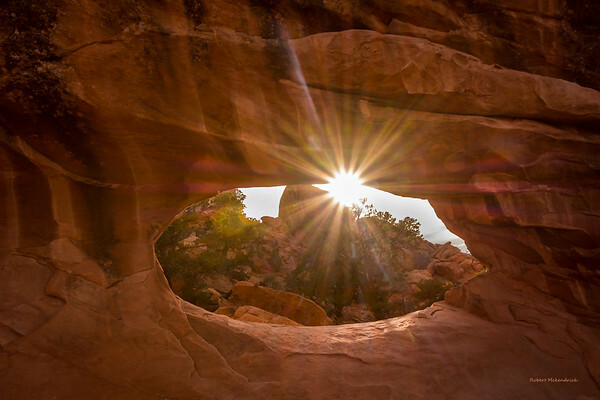 The evening sun sets over Arches National park and shines through the bottom Arch of Double O. 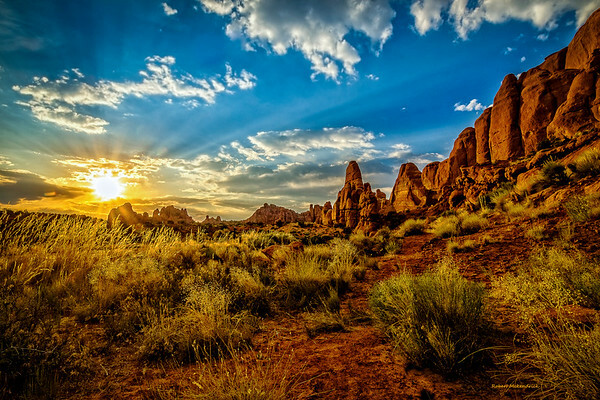 Evening in Arches National Park brings spectacular views as the colors change with different hues as the light changes from the setting sun. 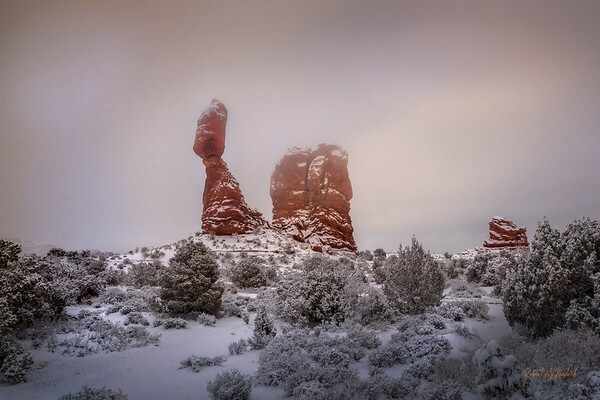 The beauty and contrast of the red sandstone rock formations set against the white snow of winter. 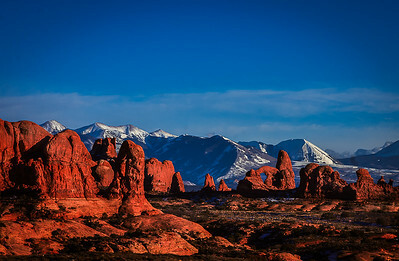 Along with the last warming rays of the sun for the day shinning with the cold blue La Sal mountains in the background.